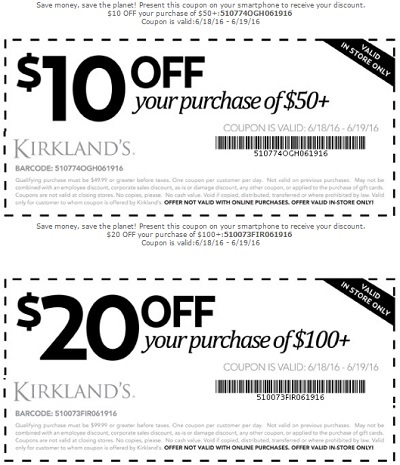 Hurry up, only hours left to save with printable coupon at any Kirkland's store location in the U.S. There are 2 ways to save. Spend up to $50 and take $10 off your purchase. Or, spend over $50 and take $20 off your purchase. Coupon must be printed to receive the offer in-store. To receive the offer online use promo codes SAVE10 or SAVE20. Source of the information is Kirkland's. Offer expires today on Sunday, June 19, 2016. For more details visit any Kirkland's store location in the U.S. or Kirkland's online.